Middleweight, Not Middle of the Road The initials CBR® are known on racetracks the world over. So you can be sure that any Honda that carries them has truly earned them. The CBR®500R is no exception. Equipped with bodywork inspired by CBR®600RR and CBR®1000RR, it tells the world you’re riding a sportbike from the winningest company in the world. Its lightweight 471 cc engine delivers smooth power all the way to the redline thanks to its Programmed Fuel Injection, while its sport-tuned chassis with steel tube frame and Honda’s unique Pro-Link® suspension let you carve corners with confidence—especially since you have anti-lock brakes triple-drilled disc at your command. 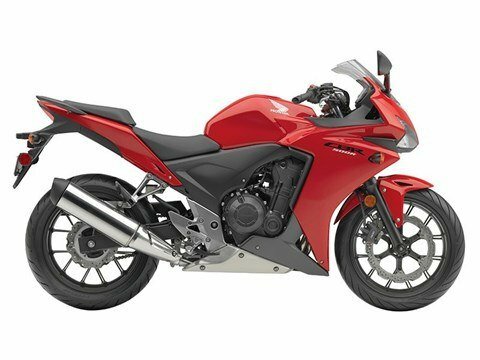 The CBR500R is the perfect next bike for riders ready to move up a displacement class, or for anyone who knows that a 500 is the perfect do-it-all street machine. Strong and stylish, the CBR500R’s aluminum 12-spoke cast wheels are easy to keep clean, look great and are another MGZ feature that just makes sense. A full LCD screen features a digital speedometer and tachometer and more, including a clock, odometer, trip meter, real-time and average fuel consumption meters and illuminated engine diagnostic indicators. Honda twins are famous for their versatility, and the new CBR500R engine is one of our best ever. Using the same piston bore size as our CBR600RR sportbike, the parallel-twin engine offers accessible performance across all RPM ranges. Twin 55-watt H7 halogen headlights and multi-facet reflectors on the CBR500R give the front end a unique look and also project plenty of light on the road for visibility. Programmed Fuel Injection (PGM-FI) continuously monitors several variables to ensure the correct fuel mixture is delivered for the existing riding and atmospheric conditions, ensuring a crisp throttle response throughout a wide variety of riding. A sophisticated chassis with Honda Pro-Link rear suspension, nine-stage preload and 4.1" travel gives you a comfortable ride over small bumps, while capably absorbing bigger bumps to increase riding comfort and handling. Beautifully polished stainless steel exhaust is integrated with the rear footpeg set for clean, functional design. A motorcycle’s frame is the basis for its handling. A new take on a classic construction, the CBR500R’s diamond-shaped 35mm steel-tube mainframe ties to the engine with four mounts, offering a rock-solid foundation for a superior ride and handling. The new CBR500R offers a stepped two-piece seat with a low height. Perfect for around-town riding or winding roads, it also offers plenty of room for a passenger and is specially designed to fit a wide range of riders. This aerodynamic bodywork also provides significant advantages in air management for added rider comfort, along with a low drag coefficient and effective cooling. One Year	Transferable, unlimited-mileage limited warranty; extended coverage available with a Honda Protection Plan.